A dazzling cookbook with vibrant recipes, captivating stories and stunning photography from Palestine `A moving, hugely knowledgeable and utterly delicious book' Anthony Bourdain Bursting with the freshness and brightness that is characteristic of all Levantine cuisine, Palestinian food is fragrant, healthy and delicious. From a colourful array of bountiful mezze dishes to rich slow-cooked stews flavoured with aromatic spice blends, it's a cuisine that represents the very best of modern Middle Eastern cookery. 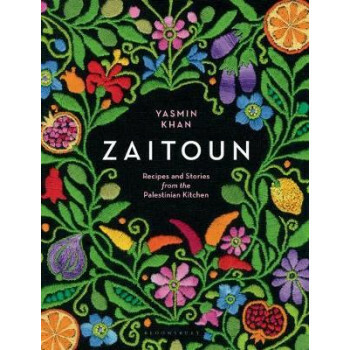 In this beautiful Palestinian cookbook, food writer Yasmin Khan shares recipes and stories from her travels through the region. On her journey she harvests black olives from the groves of Burquin in the West Bank, hand-rolls maftool - the plump Palestinian couscous - in home kitchens in Jenin and even finds time to enjoy a pint with workers at the Taybeh brewery, which is producing the first Palestinian craft beer. As she feasts and cooks with Palestinians of all ages and backgrounds, she learns about the realities of their everyday lives. Zaitoun includes herb-filled salads, quick pickles, fragrant soups, tender roasted meats and rich desserts, and has a special focus on vegetarian versions of Palestinian classics. It has recipes for olive, fig and honey tapenade, roast chicken stuffed with pine nuts and raisins, and pomegranate passion cake, among many others. And surrounding the recipes, there is a chorus of stories from those who love, live and cook with Palestine in their hearts.